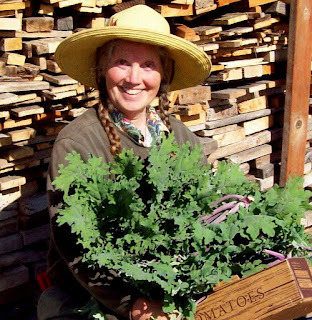 Kale - a generous plant! In recent weeks we've seen several headlines announcing that kale has made it onto the "Dirty Dozen" list for the first time in ten years. The "Dirty Dozen" list is compiled each year by testing thousands of samples of fruits and vegetables from different sources to see which have highest concentrations of herbicides and pesticides LINK. And the farm chemicals are not just showing up on the vegetables themselves, studies have shown that, people being tested have increasingly been found to have these chemicals show up in fluid samples such as blood and urine (see links below). 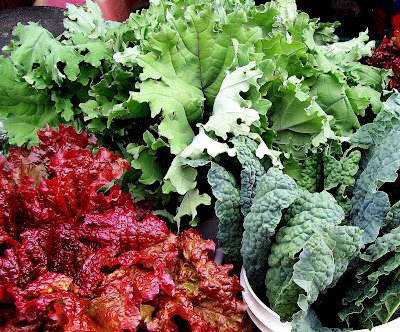 It is unfortunate that kale has returned to the "Dirty Dozen" list as, in the past few years, it has shown a surge in popularity. Its recent following is not surprising as it tastes similar to broccoli (a favorite on American plates) and it is at the top of another, more favorable list - The Aggregate Nutrient Density Index (ANDI), that rates foods by their nutrient density. 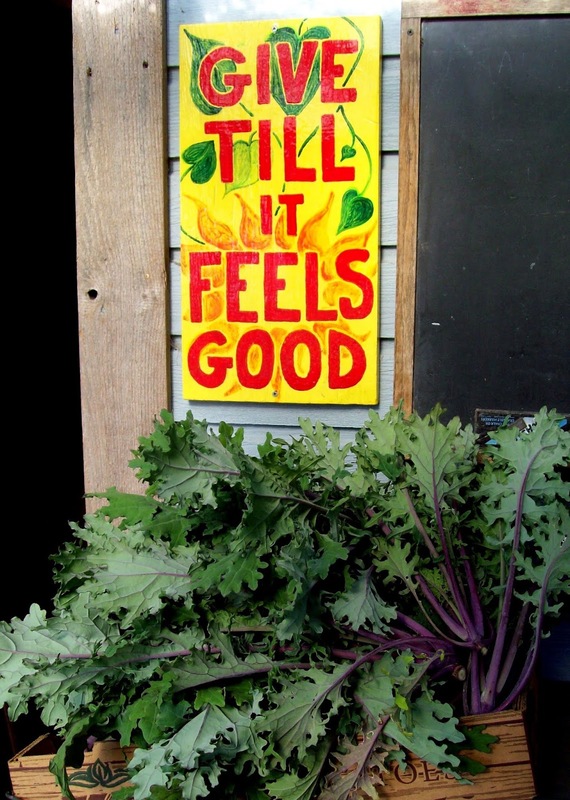 Kale has the densest concentration of nutrients, per calorie, of a wide range of foods tested. (PDF of 72 tested foods) (explanation of chart). On the positive side of things, people who have switched to an all-organic diet have been able to reduce these chemical residues in their bodies by as much as 90% in as little as two weeks LINK. So, if you'd like to incorporate more organically grown kale into your diet and you're on a budget (we've noticed that prices for organic kale have really risen in the past few years...) perhaps you'd like to try and grow your own! 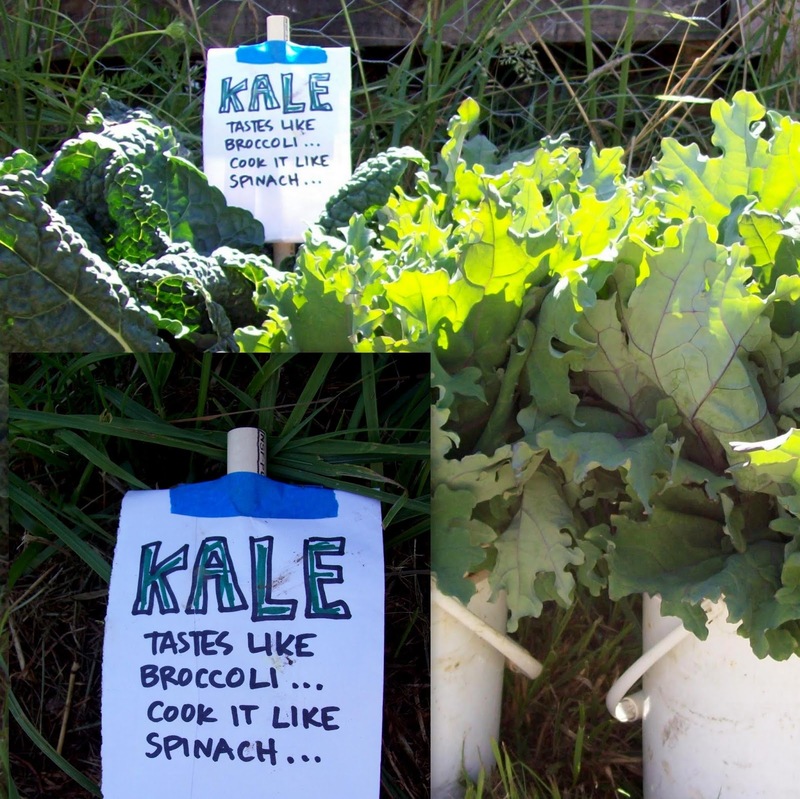 Kale is very easy to grow! 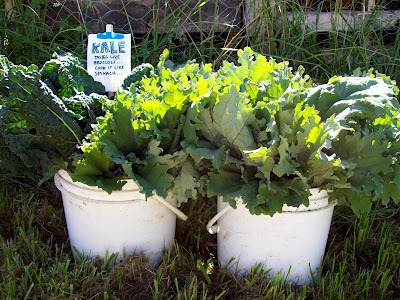 Here's our POST on growing kale. Grow your own kale: Kale is super-easy to grow and 2-4 plants will easily keep a family fed over the course of the summer. If your climate isn't too harsh you can grow a second crop that will produce food through the fall and winter too (though at a much slower rate). 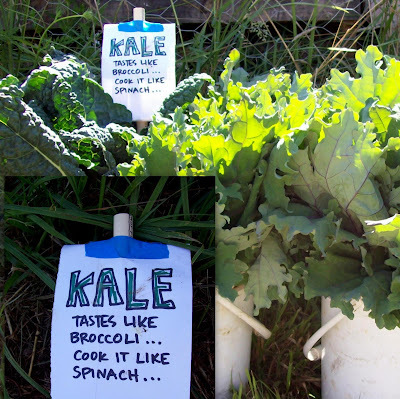 Here's our POST on growing kale. 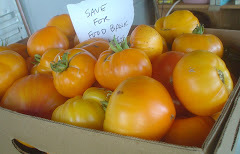 Our CSA provides delicious, nutritious food May to November. Or, if you live in our area, you can join our CSA and receive a large box of delicious organic produce on a weekly basis - including copious amounts of green-leafy vegetables. 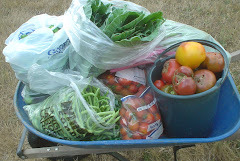 We still have some CSA "shares" to offer. 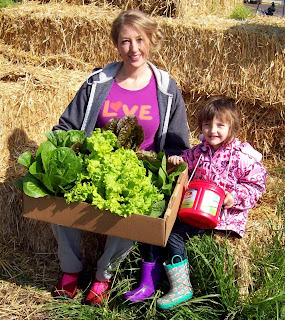 Over six-months of vegetables and fruits for $700. More info HERE. 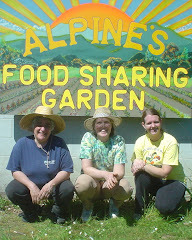 How we grow our food at the Sharing Gardens: Because we are not a commercial farm, all our labor is provided by volunteers and we are under no pressure to produce food on a forced timeline to get it to market ahead of the other farmers in our area, our food is slow-grown, with less water-weight and hence more nutrient-dense. We fertilize primarily with compost derived from leaves, grass, weeds and food scraps, wood-ash from our wood-burning stove and with worm castings we harvest from the paths of our greenhouses LINK. 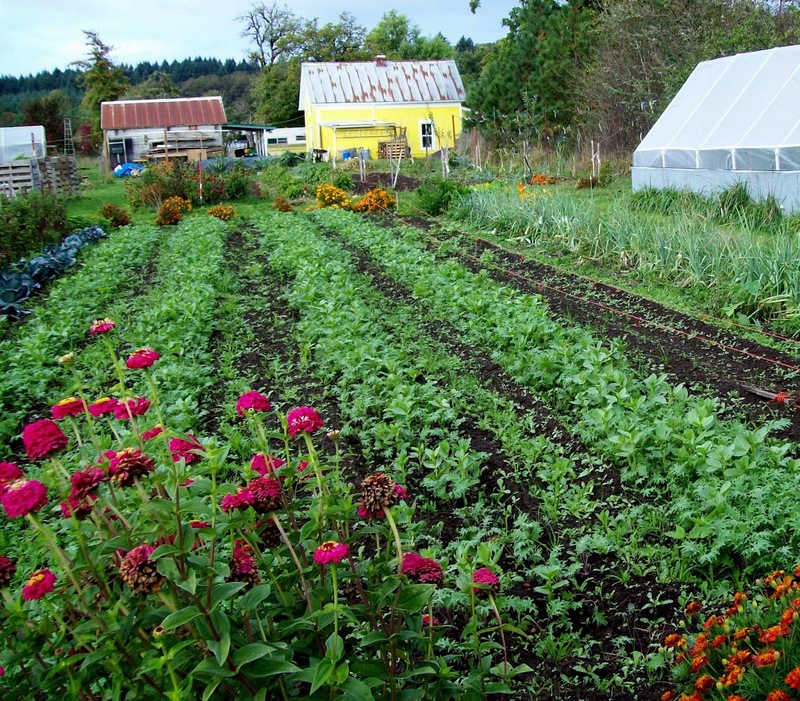 We do not use commercial fertilizers. 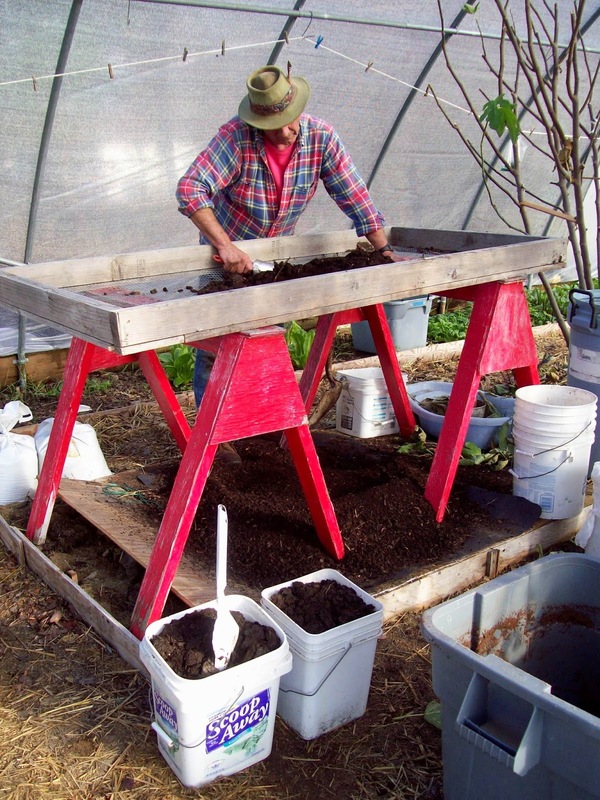 The wood-ash and the composted tree-leaves both provide re-mineralization of our soils because the tree-roots pull up minerals from deep within the soil. Without forcing our plants to grow fast with high-nitrogen fertilizers, or animal manures, they are more resistant to diseases and insect infestations that are caused, in part, by the thinner cell-walls of plants forced to grow unnaturally quickly. 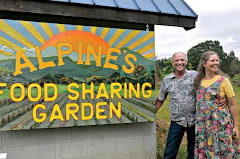 Or, if you live in our area and would like to eat the kale we donate to Monroe's Food Pantry, you can shop weekly for free at the South Benton Food Pantry (some income-criteria required). 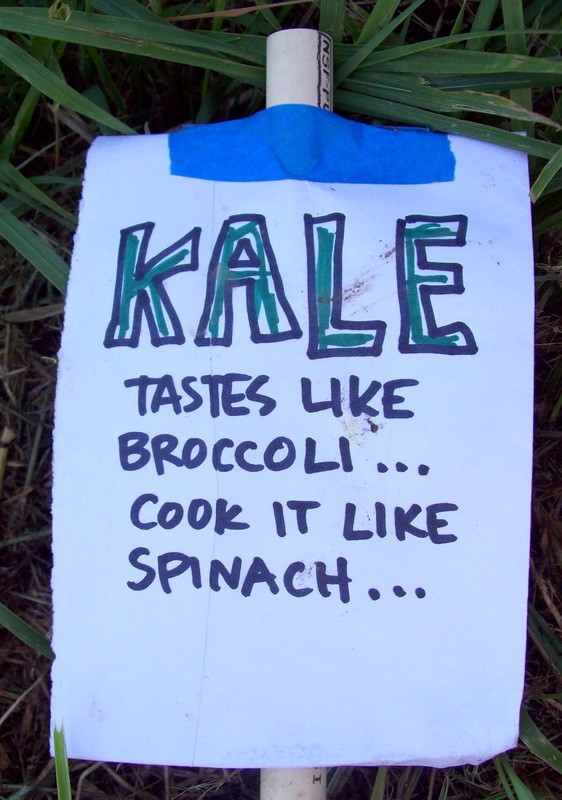 Sign posted at the Food Pantry to encourage more kale-eating. Now, doesn't that look yummy! "The King of Vegetables; 'Kale' to the Chief!" 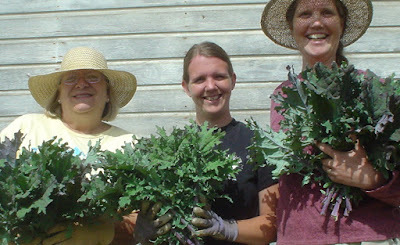 Cathy, Danielle and Llyn with "bouquets" of Red Russian kale to share at the Food Pantry. Early spring in the Pacific NW is a time of joyful anticipation of the coming growing season. We already have hundreds of seedlings started in our greenhouses and, in a few short weeks we'll be able to transplant many early-season crops outdoors. But one of the great culinary pleasures of this time of year is the kale that wintered over from last season. Kale is one of those plants that when touched by a kiss of frost, becomes more sweet and tender than when growing at the height of summer. Eat your kale for healthy skin, hair, bones and teeth! There are many articles on-line about the nutritional benefits of kale and recipes for its preparation. You will not find as many articles on-line about growing kale, using it as a cover crop, or saving your own seed which is what this article is focused on. 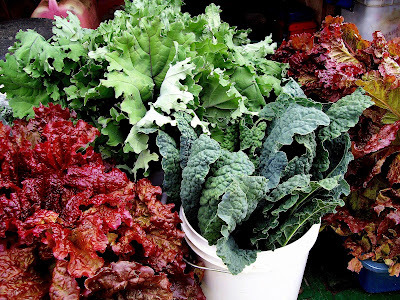 But, before we get into growing kale and saving seeds, in researching this post I discovered two important facts: Kale has the densest concentration of nutrients, per calorie, of a wide range of foods tested. (PDF of 72 tested foods) (explanation of chart). And secondly, it is extremely important that, the source of the kale you eat is organically grown. How to grow it: Kale won't grow well in the tropics or arid regions but it's perfectly suited to a moist, temperate climate such as the Willamette Valley of Oregon where we live. There are several varieties available. The main two we grow are Toscana (or dinosaur) kale. With its greyish-green leaves (without many frilly edges) and mild-flavored tenderness, it is perfectly suited to make roasted kale chips (recipe below). 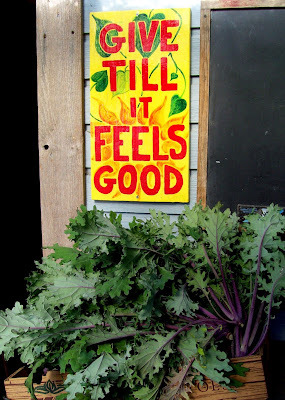 But for ease of growing and hardiness through the winter, our favorite kale is Winter Red/Russian kale. This kale actually has the nickname 'hungry gap', after the period in winter in traditional agriculture when little else can be harvested. We've had stands of it survive through all but the most sustained snow and cold, outside and unsheltered through the winter. 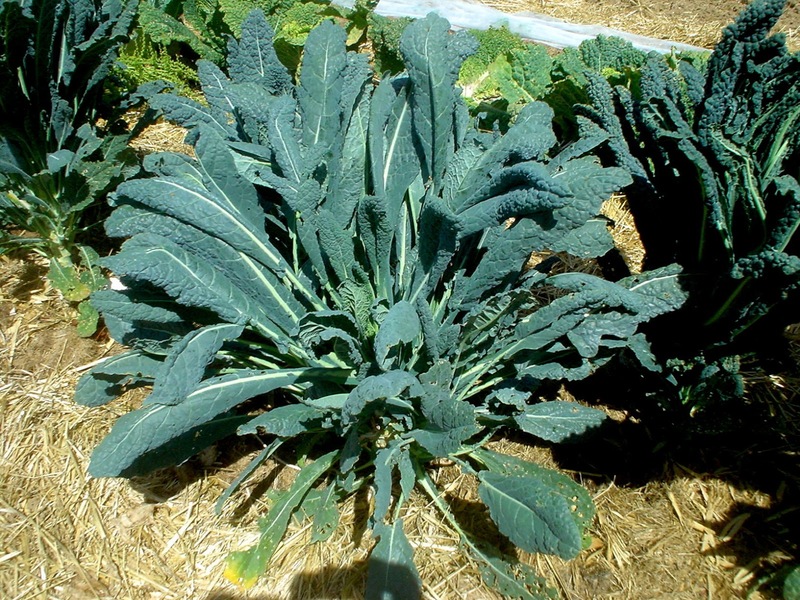 Toscana kale is darker green and its leaves are less frilly (far left). Red Winter kale, hardier and more vigorous (easier to grow through the winter) is on the right. 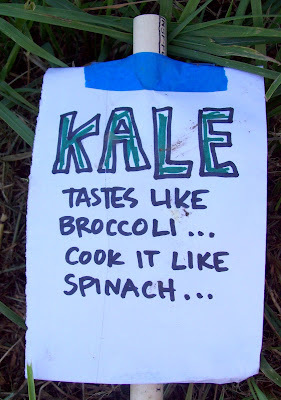 Sign, we put with kale at the Food Pantry as many people were unfamiliar with eating it. Typically we grow two main crops of kale per year. The first we start in early/mid-February. We either start them in pots/six packs and transplant them outside (late March/early April) or we start them directly in beds in the greenhouse. We pick from both these plantings all the way until mid-July when a) the leaves become bigger and less tender and b) there is so much else coming ripe that we prefer to eat! 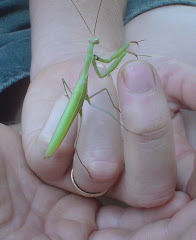 In the heat of summer they also usually become infested with aphids and become inedible for this reason. 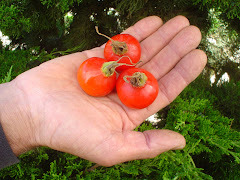 This is also the perfect time to sow the second crop of the season (more on this below). We start seeds in plastic tofu-containers with holes drilled in the bottom. 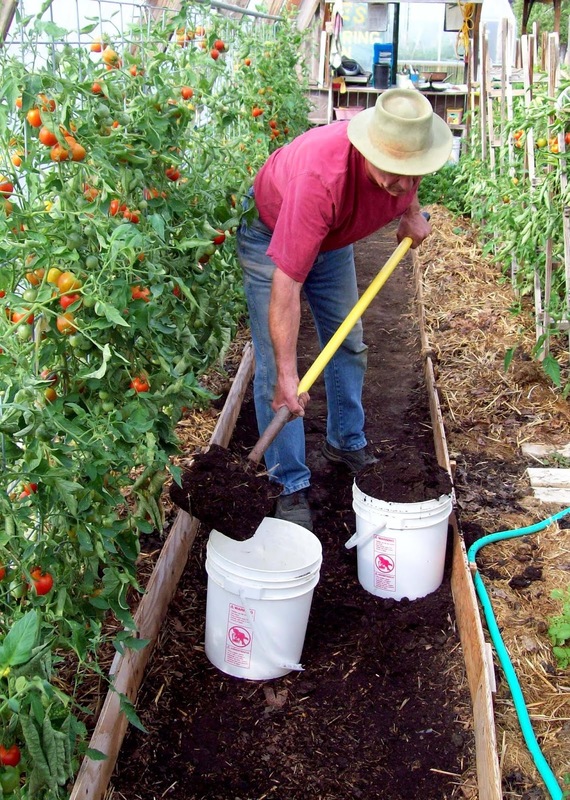 We fill the containers mostly full of soil and press the soil down evenly with the bottom of another container. 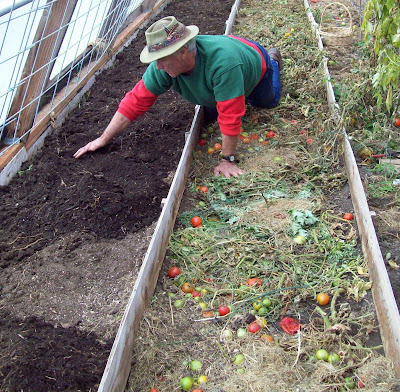 After sowing seeds, cover with scant, even layer of soil. Keep moist but don't over-water. 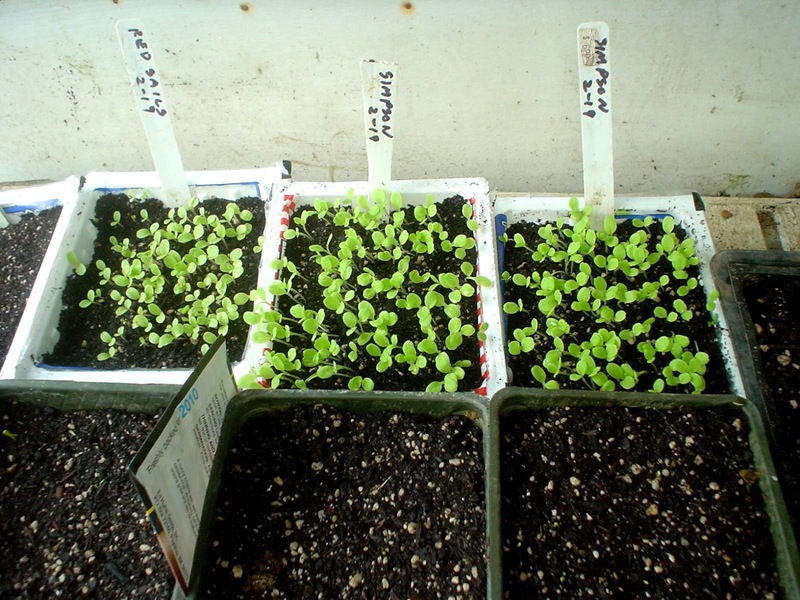 These seedlings above are lettuce plants (to show spacing of seeds). Once seedlings are large enough to handle easily and they have well-developed roots, but before they are root-bound, gently dump out the batch of seedlings and tease them apart, placing one in each cell of a six-pack. 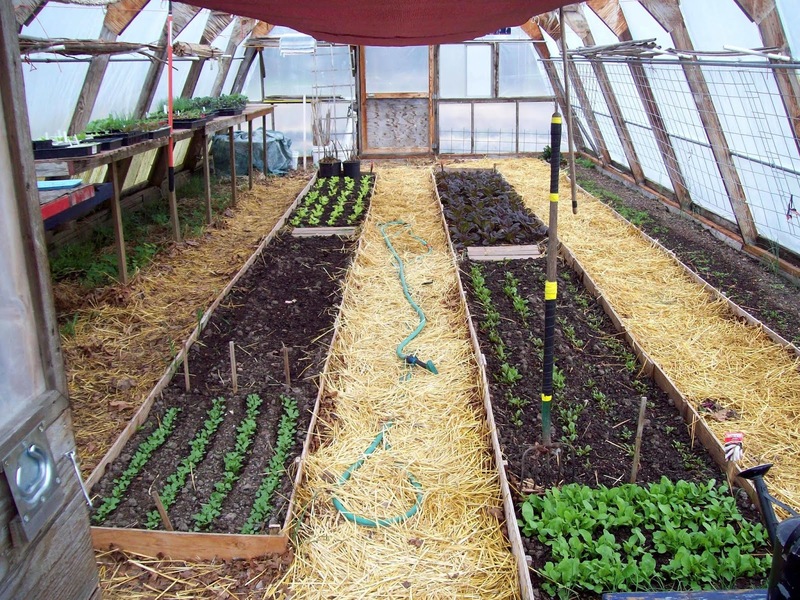 We have also sowed the seed loosely over a whole greenhouse bed in February (ideally the seeds are about 2" apart) and cover them lightly with topsoil. The kale comes up thickly filling the whole bed and grows rapidly in the protected climate of the greenhouse. It is easy to harvest whole clumps at a time with a sharp knife or scissors and, as long as you don't cut below where the leaves generate from, the kale will keep growing back all spring until a) you want to use the bed for something else or b) the greenhouse gets too warm for the cool-loving kale and it succumbs to aphids, or mold or gets too tough to enjoy. 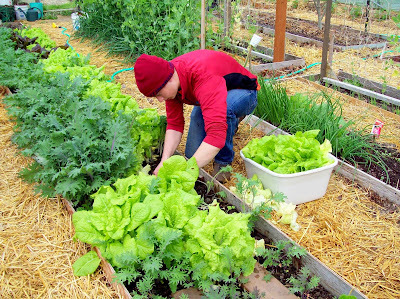 Here, Chris is harvesting kale that was sown directly in a greenhouse bed. Using a sharp knife, he cuts off whole handfuls of kale leaving the node where new leaves sprout untouched for future harvests. The leaves will continue to re-grow for many, many months. The second main crop of kale (for fall and winter eating) is sown in late July. 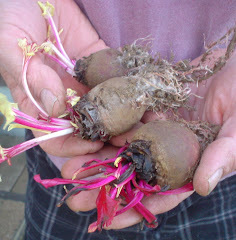 It can be done in pots and transplanted, or loosely scattered as a thick crop (either inside or outside a greenhouse). It's counter-intuitive that you start these 'winter crops' in the peak of the summer heat but the seeds need enough time to germinate, and the leaves need long enough days to gain some height and volume as they will not gain much in size once the day-length shortens after autumn-equinox (Sept. 21 or so). 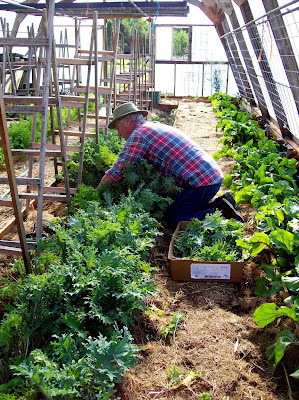 We usually find it challenging to have enough room in our greenhouses at the peak of summer to grow a large kale crop indoors but, since kale does well outside, except in all but the harshest winters, we've had good luck with growing it outside. Kale as a cover-crop: Below are some pictures of an experiment we did one year with kale as a cover crop. 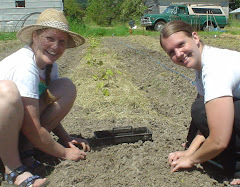 We sowed it thickly along with fava beans (tried to space plants about 2" apart). This was done by scattering the two varieties of seed and very lightly tilling them in with tiller at shallowest depth-setting. The kale did very well and lasted all through the winter. The fava beans succumbed to a sustained hard-frost and didn't survive till spring. 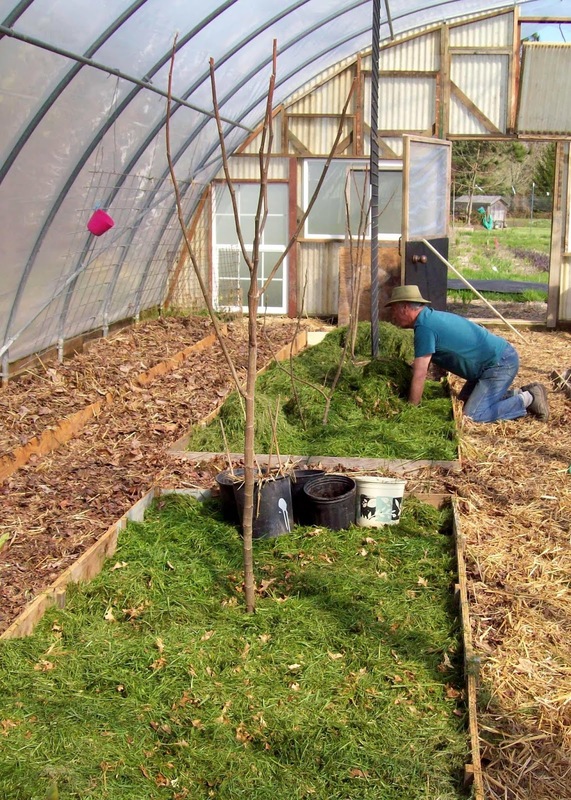 After eating kale all winter-long, we tilled the rest in as a source for 'green manure'. This worked fine but we are now moving away from using the roto-tiller in the spring as it really compacts our clay-dense soil but, if you're still tilling in cover-crops and have a lot of kale-seed, it's a great way to go! 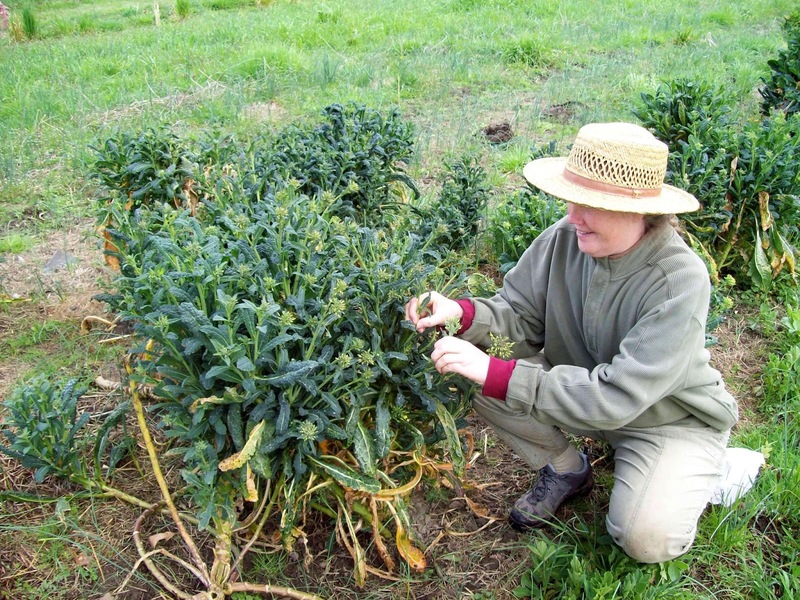 Kale and fava beans as a cover crop (planted in Sept., pictured in late October). Kale survived the winter; favas did not (froze). We ate kale all winter and tilled the kale into the soil in the spring as a 'green manure' (for fertility). The same field of kale in February. 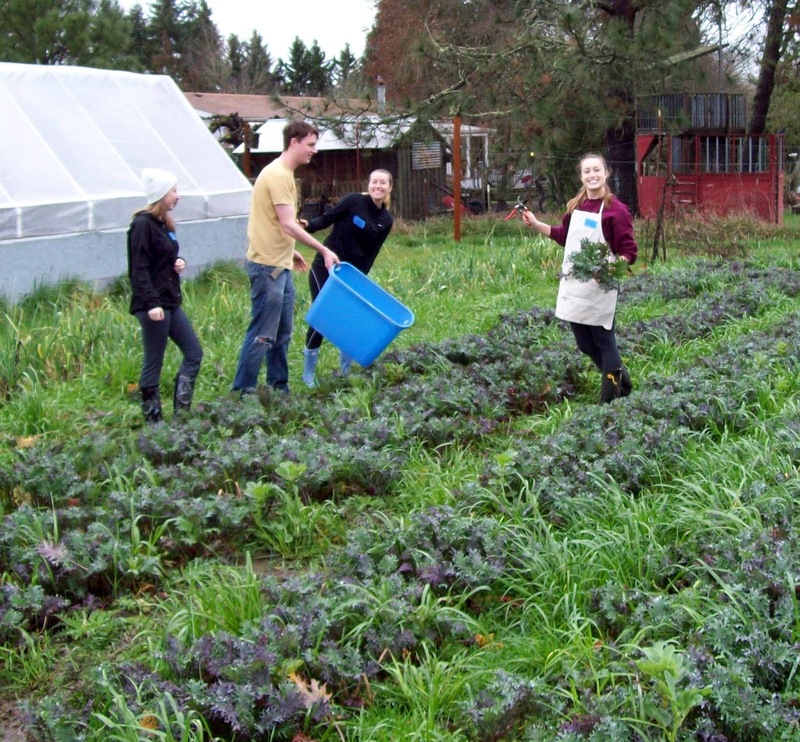 OSU students harvesting a tub-full to take home and enjoy! 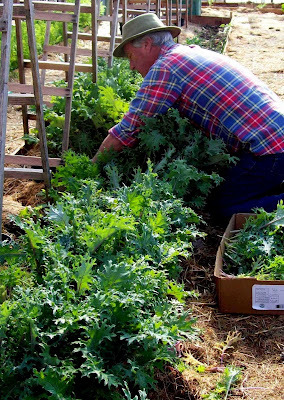 Though there are some annual varieties of kale, most are biennial and set seed in their second season, after wintering over. 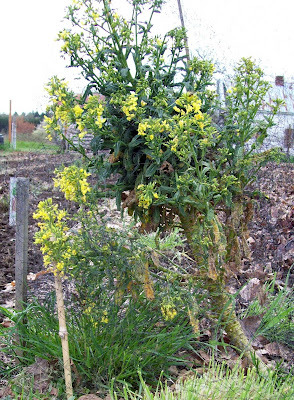 If you have some kale that has survived the winter, look for the start of flowers forming. The best time to catch them is before the flowers begin to open (below). 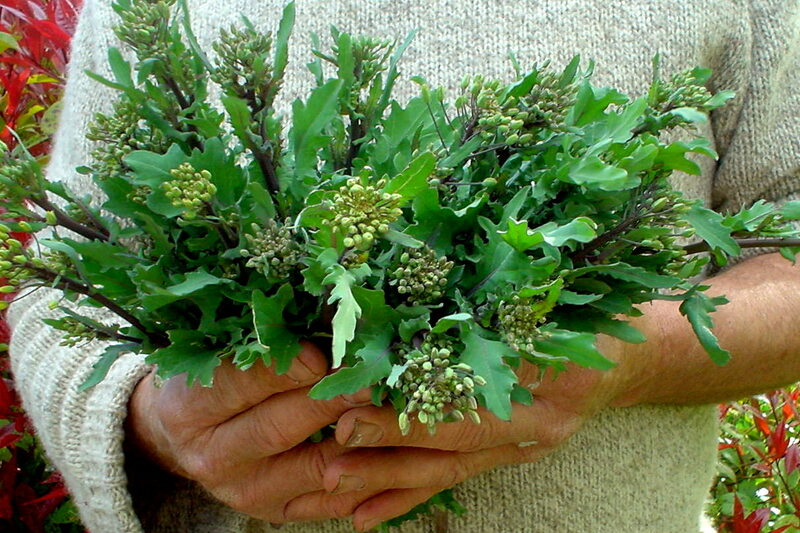 These kale flowers, called 'raab' (pronounced 'rob') are very tender and have a slight 'sweet' taste. They are loaded with vitamins and minerals. 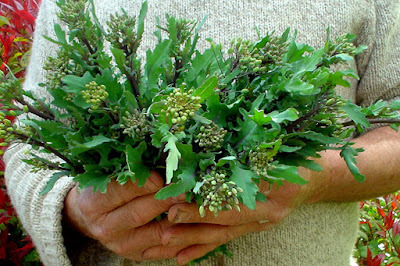 Kale 'raab' (pronounced 'rob') is the flowers of the plant before they fully open. Tender, sweet and densely nutritious; a springtime treat! 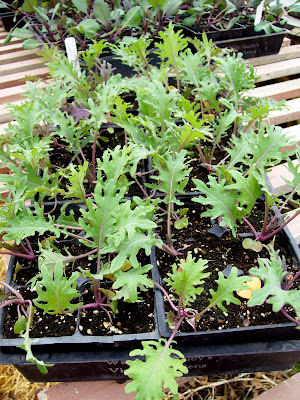 (pictured: Red Russian kale-raab) Note: Pick some leaves and stem along with the flowers; they'll still be tender at this time of year. 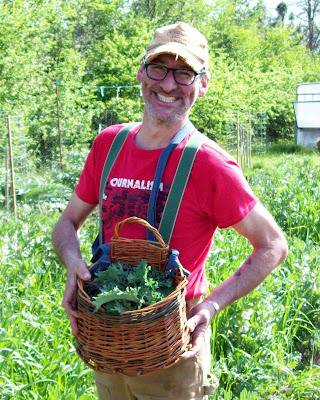 Here's Llyn picking raab off a Toscana kale plant in March or April. 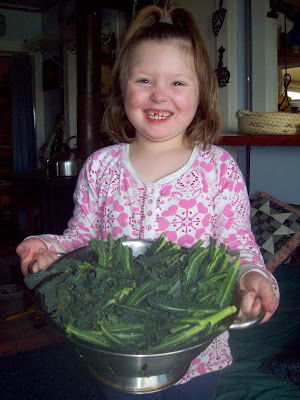 Bella loves kale, raw from the garden! We prefer to steam it for about 7-min. and eat it with apple-cider vinegar or a touch of butter. 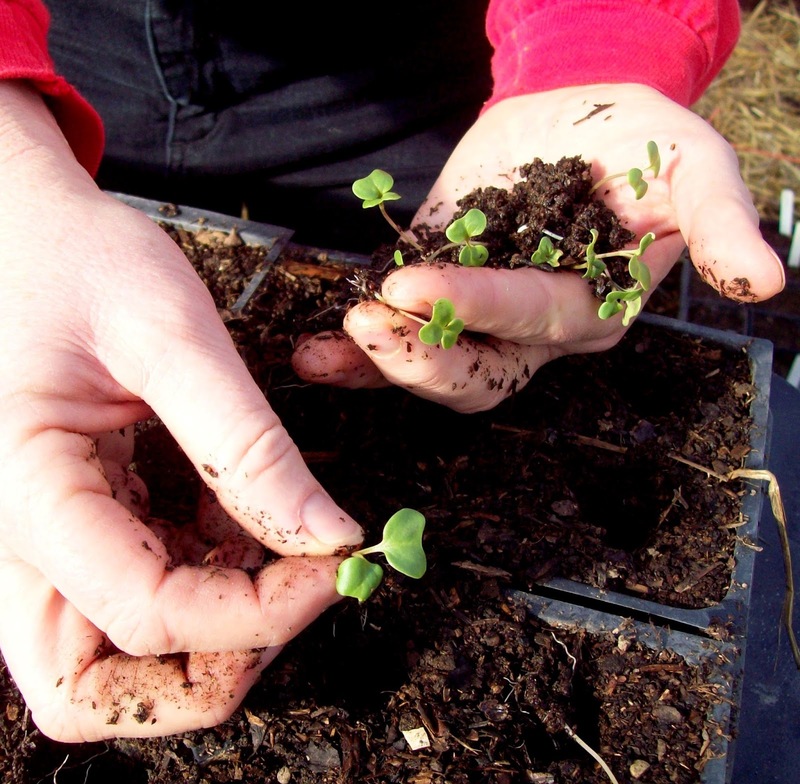 Saving seed: One of the pleasures of growing your own food from seeds is to begin to save your own seeds. With most varieties, it's not difficult and the seeds you save yourself will naturally select/adapt to be more perfectly suited to your local climate and conditions. 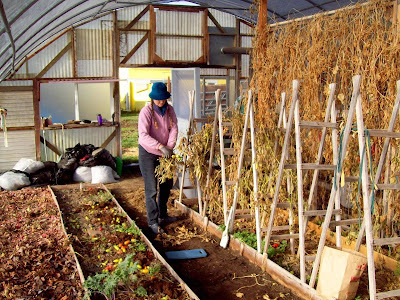 It also contributes to having a greater sense of local food-security in case there ever comes a time when seeds are not distributed over long distances, or there is a seed-crop failure in another part of the country. 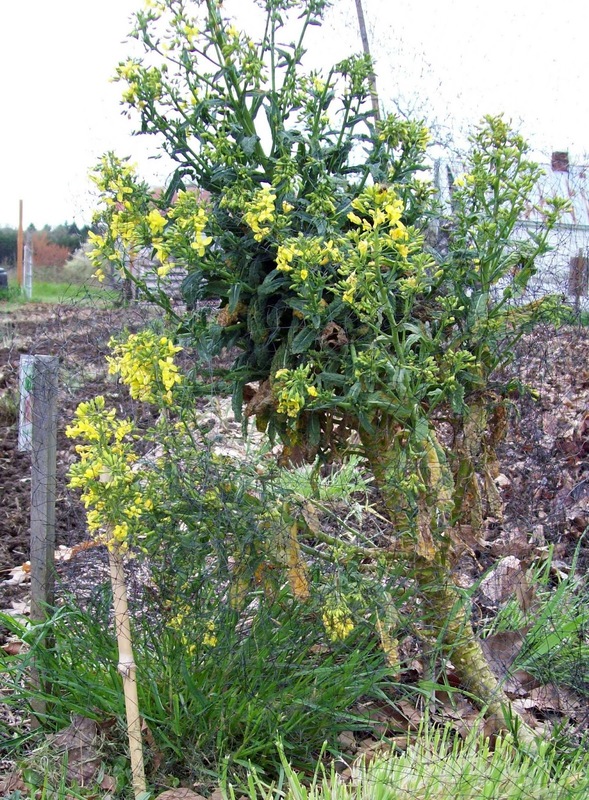 If left to mature, the raab opens up into yellow flowers. Once the flowers open, the plants become more woody and less pleasant to eat. 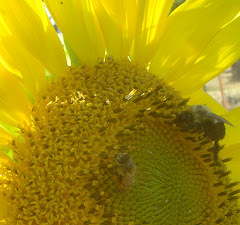 The flowers are pollinated and become seed-pods. Each plant can produce thousands of seeds! Wait to harvest the seed-pods till they are mostly turning purplish/tan and the pods are drying out (see above). 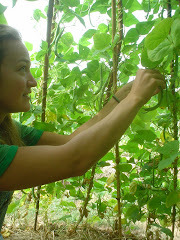 When ripe, the pods will easily open by rubbing them between your fingers yielding multiple seeds in each. It's important to find the right time to harvest seed. You want to be sure the seeds are ripe enough that they are fully black and pop easily out of the pods, but don't wait so long that the birds eat your seed, or the pods shatter and spread the seed onto the ground below. Regardless of your best intentions, there are always some seeds that shatter out of the pods so you can anticipate 'volunteer' seedlings to germinate in places you've let kale plants go-to-seed. We have one place in a greenhouse that has germinated kale plants for a third season in a row since we last let plants go to seed in that spot. That's what we call a 'high-quality problem'! 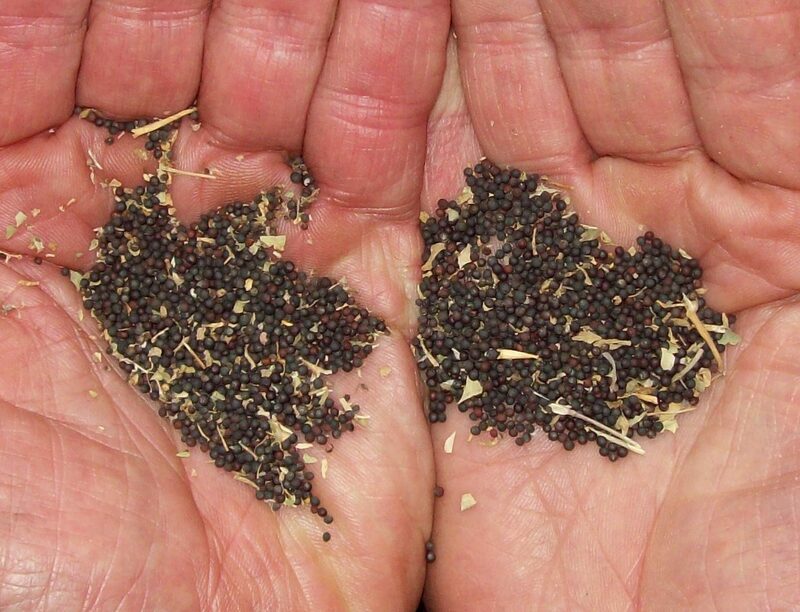 Mature kale seeds. Each plant is capable of producing thousands of seeds. This is just a small fraction of those saved from one plant. You need to have some way of catching the seeds as the pods dry and open. After clipping the ripe seed-stalks, slip them gently in a paper-sack and hang in a dry place where birds and other animals can't reach them until the pods are all dry. You can also put them upside-down in a plastic tub or bucket. We have hung them from the rafters of our garden-shed, or on a shelf above our wood-stove, or put them in the greenhouse in a tub, on a shelf, covered by screens (to keep animals from eating them). Seeds are ready for winnowing (separating seeds and chaff) when the pods are crisp and dry and crush easily by rubbing them between your hands. 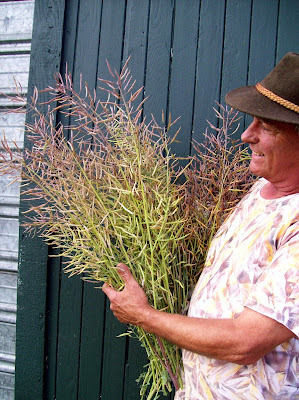 If it isn't in a tub already, carefully place the stalks of seed-heads into a tub and rub the pods between your hands to shatter them and release the seeds. As each stalk is cleaned, remove it from the tub. In the end you will have a mixture of seeds and dried leaves/pods (chaff). Winnowing is described in the caption below. Here, Chris is giving a demonstration to Rook and Cindy of winnowing bean seeds (separating the seeds from the chaff). On a lightly breezy day, or in front of an electric fan, slowly pour seeds from one container into the other so the breeze blows the chaff away and the seeds fall into the lower container. Storing seeds: Often, after winnowing, we continue to dry the seeds on a shelf above our woodstove. It is very important that they be totally dry or they can develop mold during storage. Heat can also destroy seeds so don't dry them any more than is necessary. Store seeds in a cool, dark place (or in your freezer, in an airtight container if you have the room). If you are new to saving seeds, check the plastic bags, jars or bottles a week or two after you store them to check there's no mold growing. We've lost a few batches due to mold which is always a sad thing when you go to check your seeds at the beginning of the next growing season. 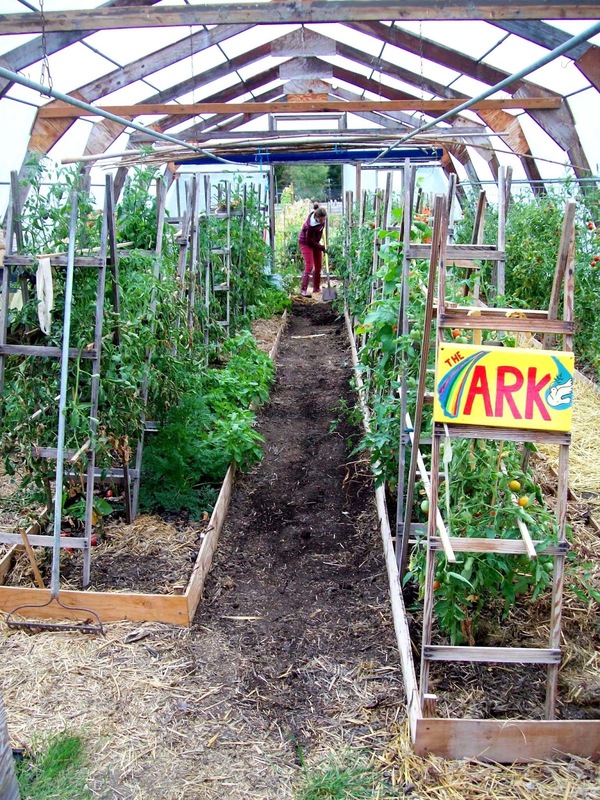 Here's a LINK listing all our other posts about saving your own seed. Delicious and nutritious, spring "greens": Toscana and Red Russian kale flanked by "Red Sails" lettuce. Kale is easy to prepare and eat. We mainly use it steamed with a little apple-cider vinegar or lemon juice sprinkled on top, or a little butter but it it also good in smoothies (recipes), fresh in a tossed salad (recipe) or baked into chips (recipe). There are many great recipes on line. Always rinse well before using. 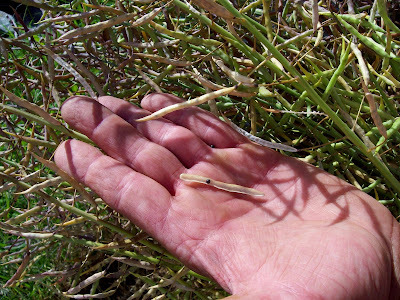 In the spring, when plants are small, the ribs will be tender and can be chopped right in with the rest of the leaves. As the plants mature, the ribs become more woody so best to slice them out and compost them. Kale is incredibly nutritious. A 3.5 oz. serving (100g) gives you 7% of an adult's protein needs for the day as well as 5%- 15% of several vitamins and minerals. It is also very high in fiber. This 'ANDI' chart (below) lists 72 foods, rating them by their concentration of nutrients per calorie. Kale is #1! They're not suggesting that you rule out the foods that are higher in calories and less dense in nutrients (healthy bodies need high-quality fats, carbohydrates and protein) but most of us are deficient in the micro-nutrients (vitamins, minerals etc) and fiber, that are essential for all our metabolic processes and optimal health. (LINK: Aggregate Nutritional Density Index - note, kale is #1) (LINK to one-page, printable ANDI chart). Here is a recipe I developed over the years for a delicious, whole-grain corn-bread mix. I make it in bulk, pre-mixing all the dry ingredients so, if we want a loaf for breakfast or guests, or potlucks, it's a simple matter of adding the wet ingredients and popping it in the oven. For best results, use all 'organic' ingredients. 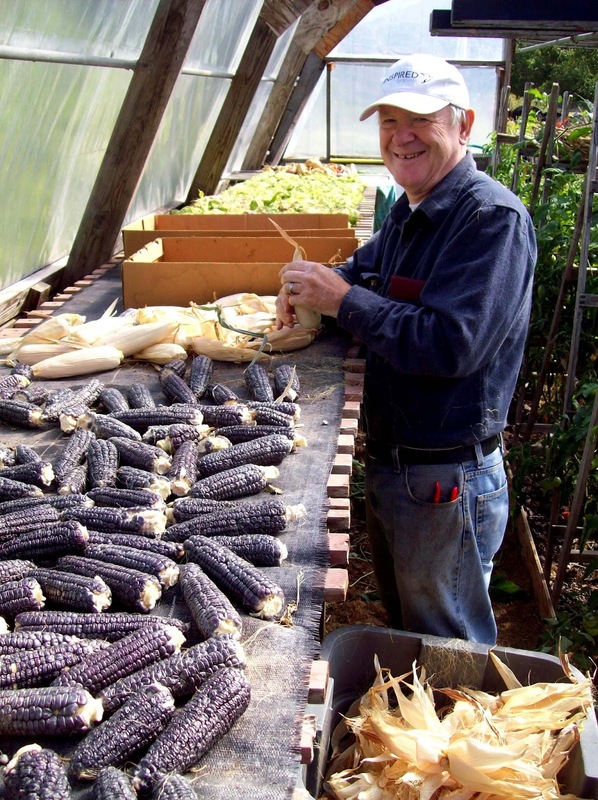 Most corn grown in the United States that is not-organic, is GM (genetically modified) and both corn and wheat, even if not GM is often grown with heavy pesticide use. 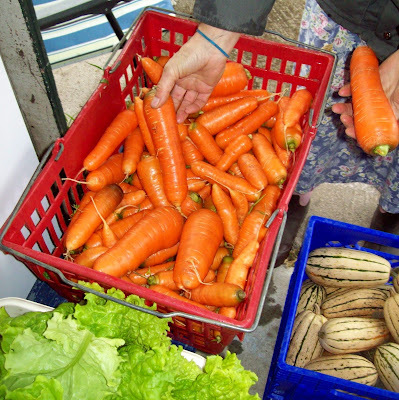 "Organically grown" means: good for your health; good for the health of the planet! We grow our own blue-corn for meal. Corn Bread Mix (makes enough for about 13 loaves). Mix all the flours and meals together thoroughly. I like to use my hands! Mix the two bowls of dry ingredients together. Take extra-care to be very thorough in this mixing process, otherwise you may have some loaves that don't have enough baking powder to rise well, or a loaf might be too salty (or not salty enough). Store in an airtight container, in a cool place out of direct sunlight. Corn products are especially susceptible to rancidity. Recipe for Individual Loaves: Preheat oven to 350 degrees. 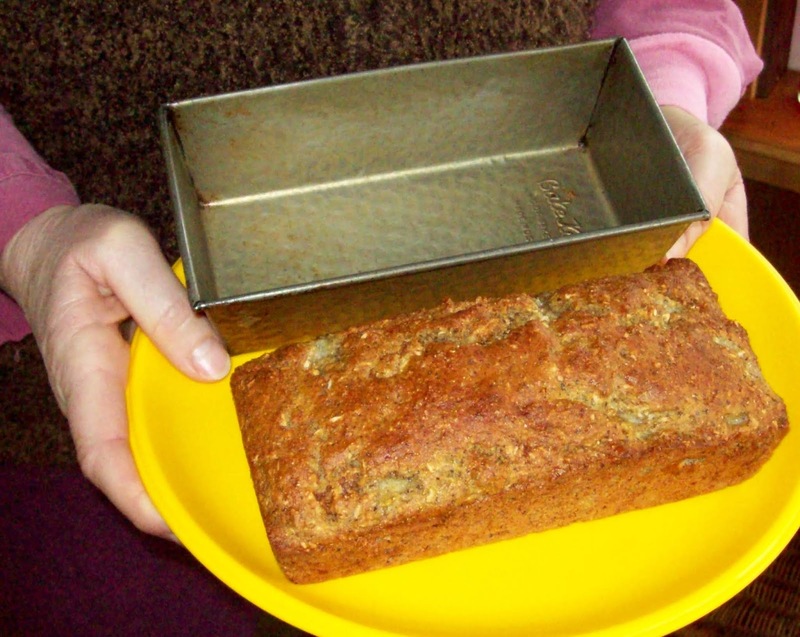 Oil 7.5 " x 4" mini-bread pan (see picture). Measure wet ingredients, whip briskly - thoroughly mixing. For best results, bring wet ingredients to room temperature. Add dried fruit/nuts, or savory ingredients (see notes below). Mix well. Add bread-mix. Gently fold together so all flours are moistened. Don't over-mix because the baking powder works by creating air-bubbles. Mixing too briskly causes them all to pop, making a flat loaf. Let batter stand in bread-pan for five minutes before putting into pre-heated oven so baking powder can begin to rise. Bake for 30-35 min. (till top is brown and toothpick inserted comes out dry). 1/4 - 1/2 cup - This recipe is nice because it can be made sweet or savory depending on what meal it's accompanying. Be creative! (See variation-notes below). Blue Corn Meal: Blue corn meal is higher in protein than yellow corn meal (by as much as 30%). We like to grow and grind our own - LINK. 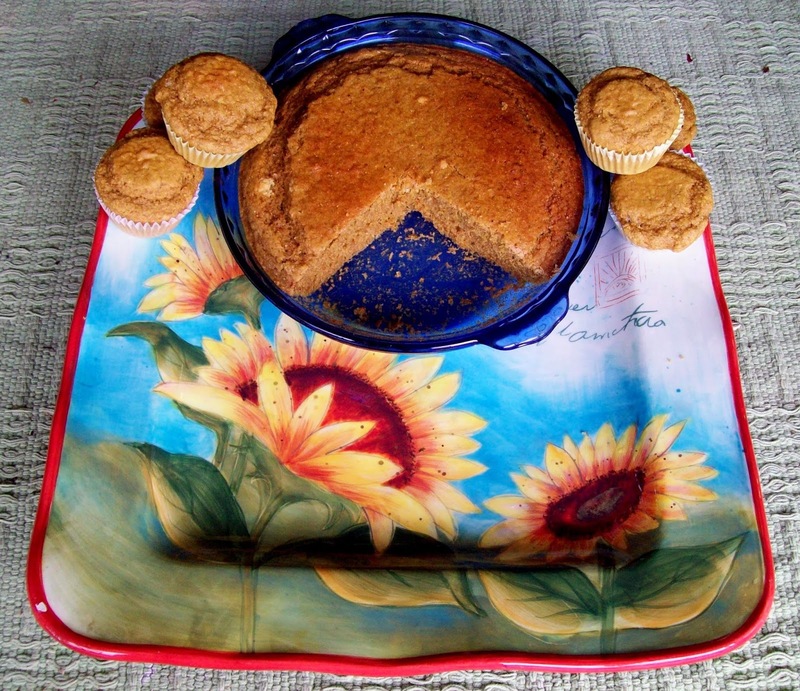 Coconut Flour: We recently discovered coconut flour and love using it for many purposes: we sprinkle about a tablespoon on our bowls of hot cereal, we use it in pie crusts and sometimes use it to thicken smoothies. Important: if you experiment with substituting it for regular flours, it is highly fibrous so use it in place of an other whole grain at a rate of 3/4:1 (if receipe calls for 1 cup WW flour, use 3/4 cup coconut flour instead). Baking Powder: Baking powder, especially if exposed to air and moisture will lose its potency over time. So, don't buy more than you can use in 6-9 months and store it in an air-tight container. Ground seeds: Using a 2-cup measuring cup, fill to 2/3 cup with chia and poppy and then top it off with flax-seeds up to 1.5 cups. Grind the mixture of seeds using an electric coffee-grinder that is dedicated to non-coffee grinding-- or cleaned very well. chopped red-peppers/green onions/small cubes of cheese. Pancakes - thin the batter with a splash of soy-milk, milk or water. 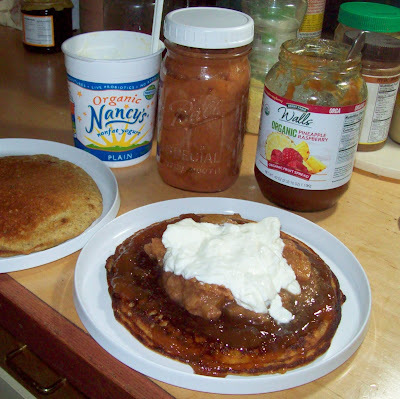 Great with homemade apple butter, yogurt and honey or your own favorite topping! Thin the batter for pancakes and add your favorite toppings. 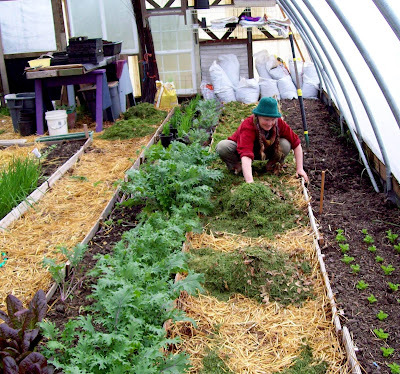 For those of us with greenhouses in which we plant directly in the ground (as opposed to using the GH to protect seedlings in pots, on tables) the necessary pathways between planting beds can seem like a lot of wasted space. 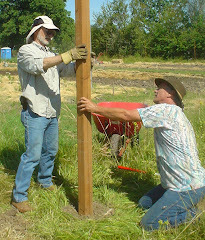 Over the years, we've developed a method of composting right in the paths, creating habitat for worms and micro-organisms so that, over the course of the growing season we generate (and then harvest) large amounts of fine, high-quality worm-compost using locally available materials often considered "waste" products. We describe our methods below. For many farmers\gardeners, if not most, fertilizing the soil means adding some type of manure and\or other animal-based products such as bone meal, fish meal, blood meal, feather meal, etc. Here at the Sharing Gardens, we are interested in developing, and demonstrating ways of growing food that uses local materials, gathered in a sustainable way with a gentle impact on the environment. "Vaganic" agriculture: good for the Earth, good for our health. 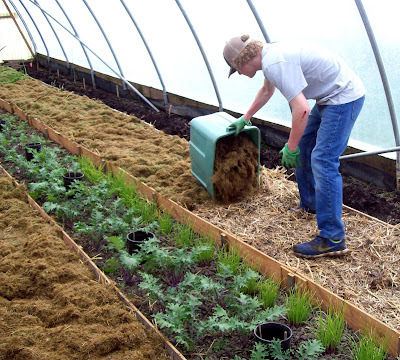 Here is our current method of building our soil-fertility - right in the paths of our greenhouses! 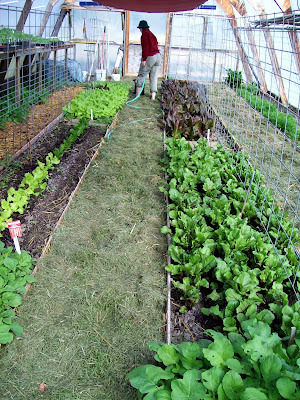 Gathering Materials: Our method of gardening requires massive amounts of "organic matter" (leaves, straw, grass-clippings etc). 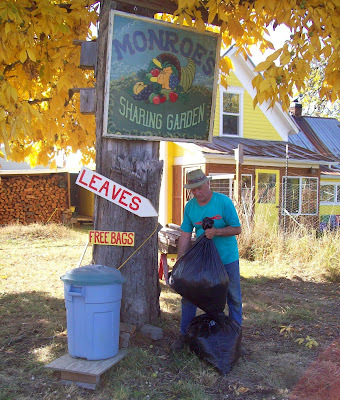 In the many years since we started the Sharing Gardens (2009) we have developed relationships with the people in, and around our small town encouraging them to bring us these materials instead of burning them or sending them to the land-fill. 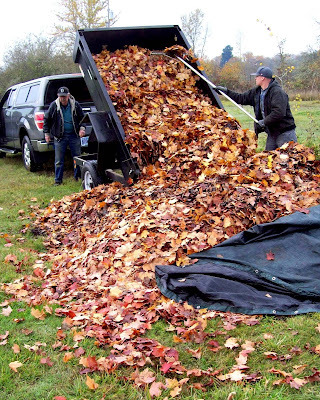 One of our neighbors brings us many trailers full of leaves each Fall. He used to burn them. 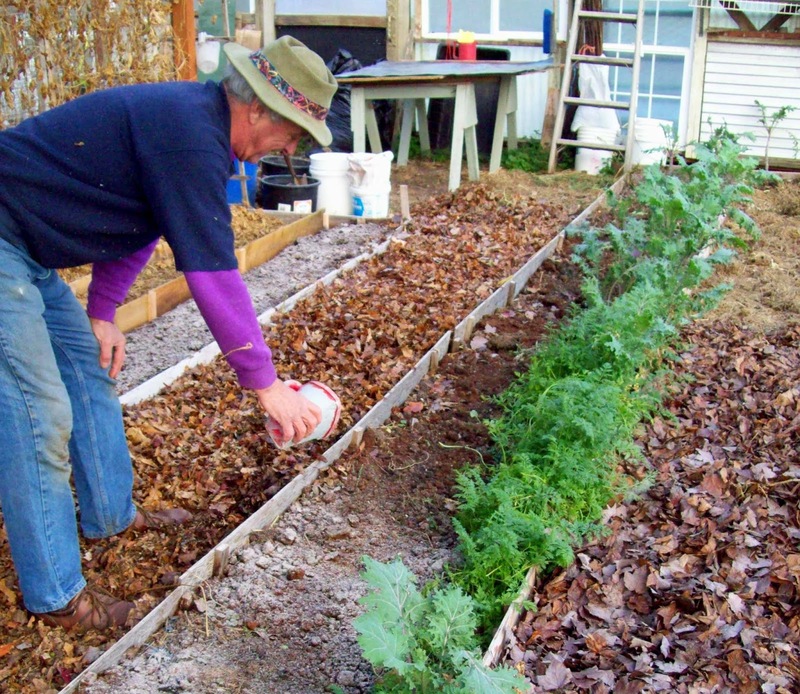 Now he uses some to mulch his own garden-beds but still has plenty of surplus to share with us. Our land is over three-acres. 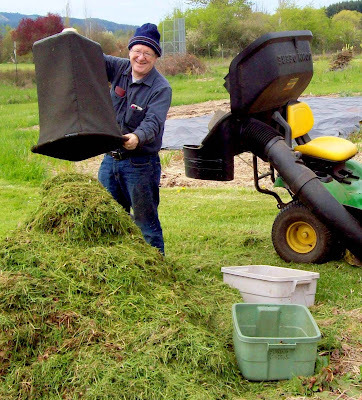 We have left much of it as grass so that we can harvest this valuable resource. (LINK-Grass Clippings and Leaves for Soil Fertility). When we have surplus from mulching our plants, we spread it in the greenhouse-paths to feed the worms and micro-organisms. 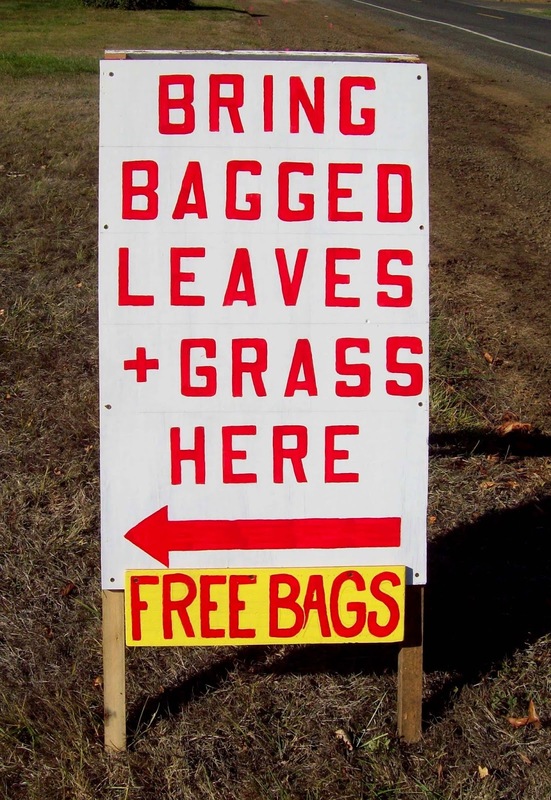 Here's the sign we painted and set up along the road in front of our house for the 2018 leaf-drive. As people donate their leaves, we hang the bags out to dry on a clothes-line in our greenhouse and roll them into bundles of 5-6. We feel strongly about minimizing the use of plastics so any time a bag can be re-used is a real bonus! We set up this station in our front yard. The trash-can has bundles of leaf-bags for re-use. Please no animal waste, trash or sticks/branches, no holly or roses (too sharp), or black walnut leaves (they can kill plants - LINK). Just leaves and grass 😊. 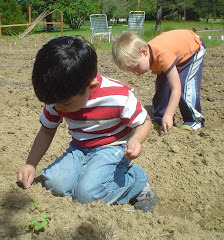 Spreading materials: Since our method of creating soil is cyclic, we could begin at any point in the process but if you are just getting started, the first step is to spread the materials. 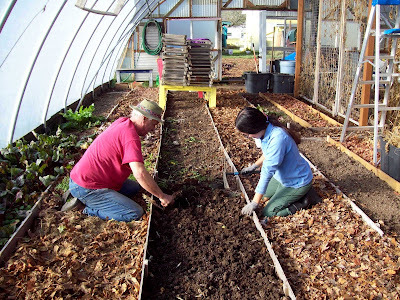 We begin this process at the end of Autumn as we are dismantling the tomato-cages, pulling up pepper-plants and weeding the beds in preparation for the following Spring. 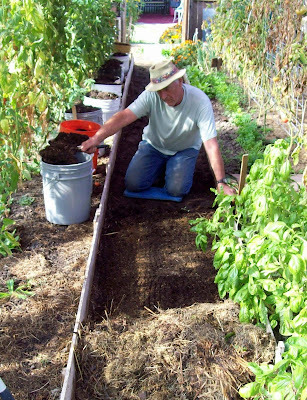 Here is a greenhouse path that has been "harvested" of its worm-compost. It is ready for new materials to be added. 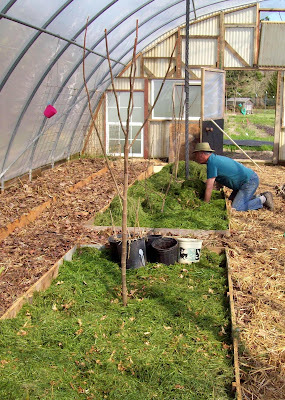 After cleaning all of last season's plant material out of the beds, cutting it into small pieces and laying it in the paths, we cover it with layers of leaves or straw, or whatever we have available. One of our neighbors thatched his lawn and brought all that wonderful grass "hay" for us to use. Here is a college student/volunteer spreading it by the tub-full. Llyn, spreading fresh grass-clippings on top of straw. 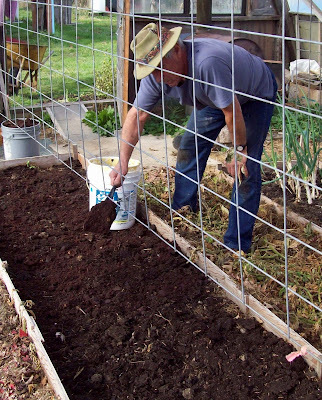 The need for sides on your beds: With this method, it is important that your paths and beds be separated with sides so your soil doesn't mix with the materials in the paths. Chris has made many of our greenhouse beds with recycled fence-boards held in place with stakes driven into the ground. We have used plywood ripped into six-inch strips too. 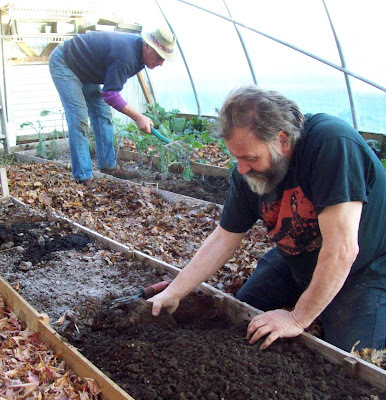 Creating worm-compost all season-long: From Spring through late Summer we continue to add organic-matter as it becomes available. 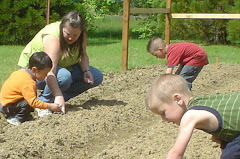 By watering the beds and walking on the paths we help the worms and other "micro-livestock" to break down the materials and turn them into soil. This picture was taken in April. Note fresh grass-clippings in center and right pathways. Straw has yet to be covered with grass on left-pathway. 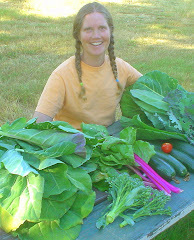 Llyn is watering the bed of lettuce and waters the paths too, to help in the decomposition process. 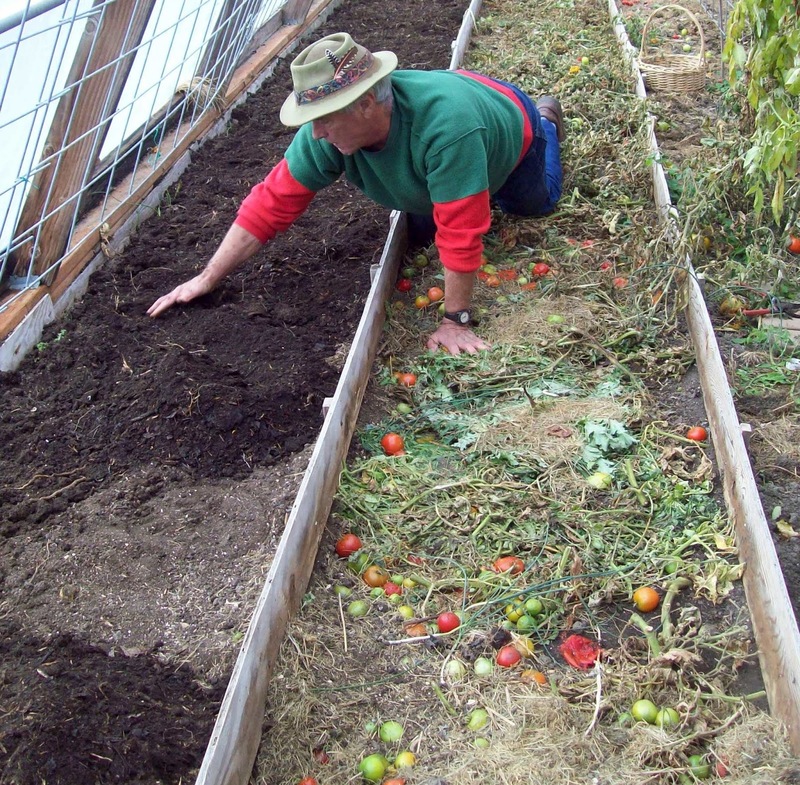 During the growing season, the worms and micro-organisms are 'digesting' all this material from below. 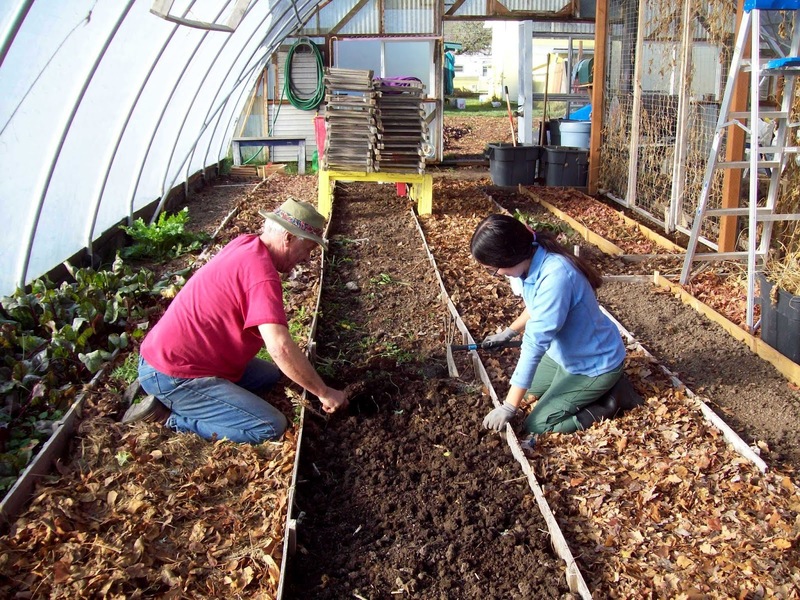 On tours of the greenhouses we often pull back the mulch to show people the thriving colonies of red-wiggler worms that live in our paths. 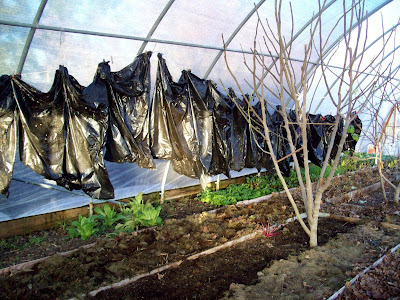 Many times we can show them worm-eggs as well and little worm tunnels they have formed down into the rich, black compost. Another benefit of this style of greenhouse gardening is that the mulched paths are so pleasant to kneel on. Also, many plant roots (figs pictured here) will reach their roots out into the paths and be fed by this 'living compost' through the growing season. 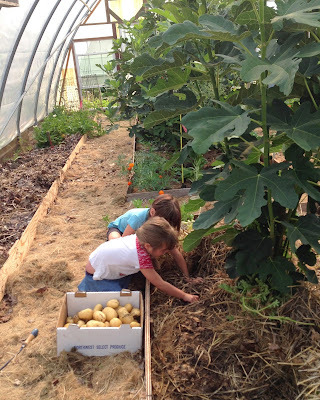 (Pictured: Bella and Adri harvesting potatoes). 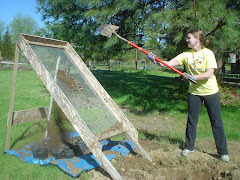 Harvesting worm-castings: We stop adding organic matter by late summer. 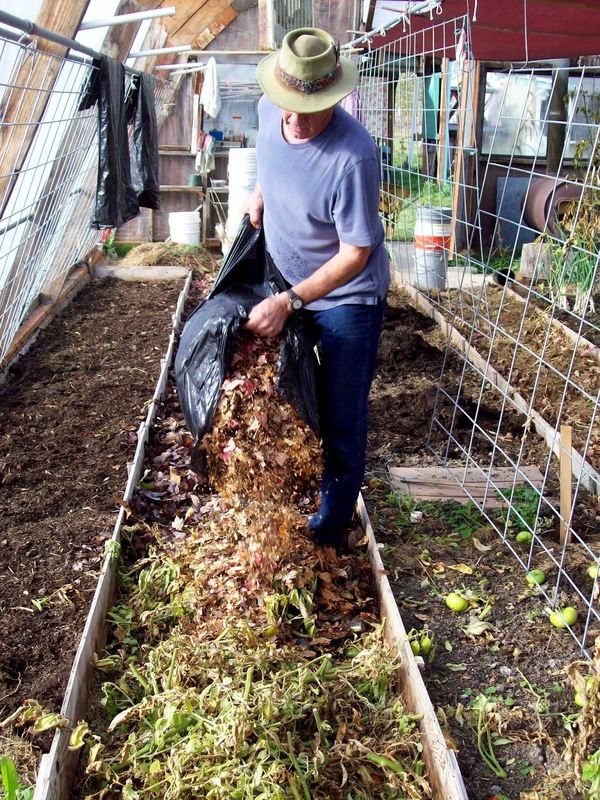 This means there is less material to move out of the way when it's time to harvest our worm-compost. 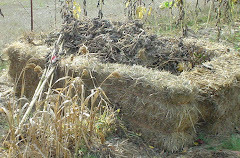 This 'undigested' material is temporarily gathered in tubs, or piles and then returned to the paths after the worm-compost has been gathered. Here, Chris scoops up the compost with a flat, hand-trowel. We collected fourteen, five-gallon buckets from this one, forty-foot path! A flat shovel works well too. This homemade sifter works well to remove large material and give the finished product a uniform texture. The screen is made with "hardware cloth", a wire-mesh with 1/2" holes. 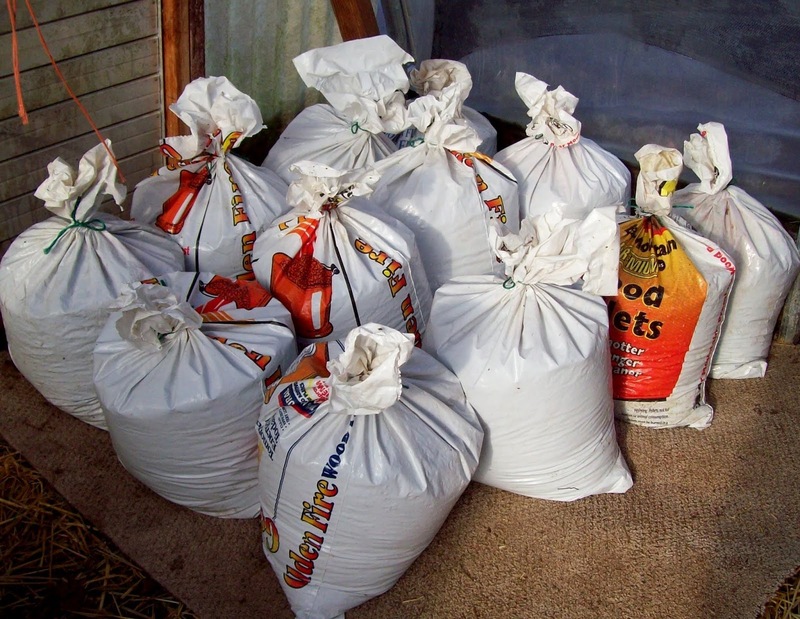 After sifting, we often store the worm compost in re-purposed pellet-stove plastic bags. Storing them in this way preserves the material's moisture. 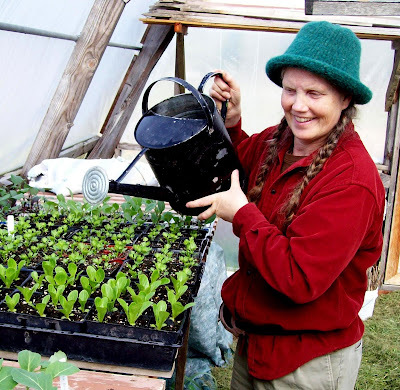 Mixing soil and starting seedlings: In the past few years we have been fortunate to have Used-soil donated from two-different nurseries at the end of their growing seasons. Though the nutrient-content of the soil is mostly depleted, the structure of the soil is still excellent as it is high in organic-matter, perlite and other substances to keep the soil light and fluffy. We are careful to only accept soil-donations from 'organic' growers (no herbicides/pesticides). 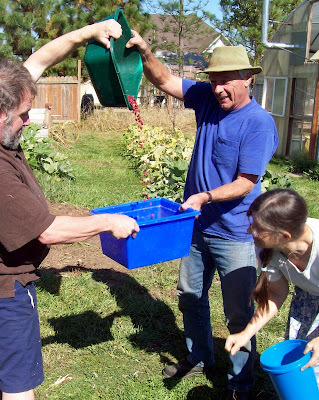 Our mix-ratio is 'one-part' worm compost to 'two-parts' depleted soil. 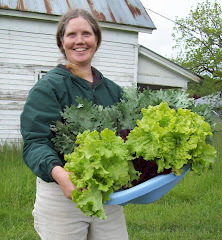 If you don't have access to previously-used soil, there are many recipes on-line for making your own. 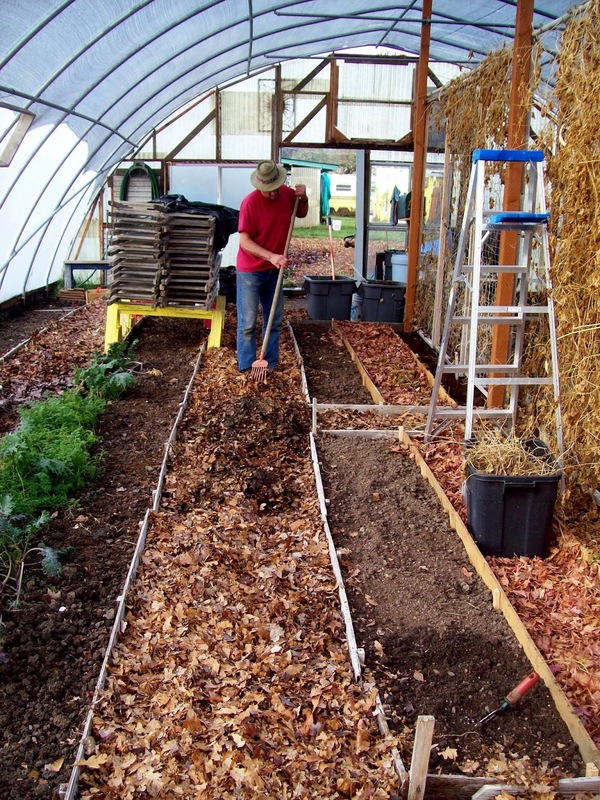 Typically they include coconut coir (a more-renewable resource than peat-moss) and sand or perlite - so the soil drains well, and compost for fertility. Use the worm-compost outlined in this article in place of the regular compost. Seedlings in our home-grown soil, Spring 2018. Preparing beds: We also use the worm compost to fertilize our raised beds. Chris spreading a layer of worm-compost in greenhouse beds. 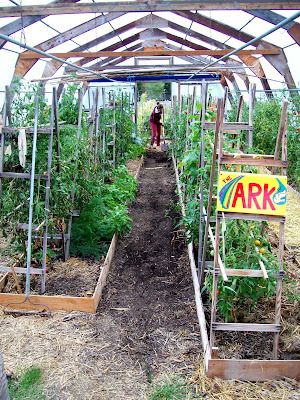 Note last year's tomatoes and other plant material in pathways (before we've added leaves on top). Excellent worm food! Spreading coffee-grounds: We have a friend who regularly stops by a local coffee shop and collects coffee grounds for us. 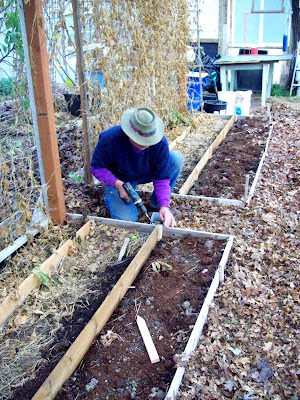 Ideally, when we have enough, we sprinkle them about 1/2" deep over the beds. Note: Though coffee-grounds are neither a local or sustainable resource, currently the are free and by using them, we keep them out of the waste-stream. Spreading wood-ashes: After coffee we add a very light sprinkling of wood-ashes (they are very concentrated and can 'burn' sensitive micro-organisms and the worms' skin and change soil pH). We only use ash collected from natural wood that has no paint or other chemical treatments. Since we heat our house exclusively with wood, this is another 'free' resource. ...and a nice time for socializing. 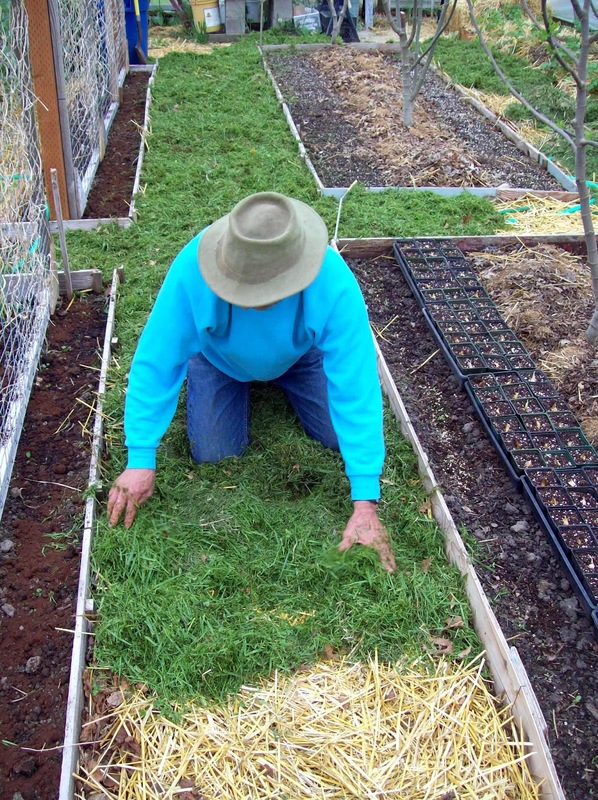 In early Spring, once we begin mowing the grass again, it makes a nutrient-dense mulch directly on the beds. Worms love fresh grass-clippings and will migrate to beds where it has been added. The cycle starts again - Spreading materials in paths: Once we have harvested the worm-compost, it's time to start the cycle all over again! 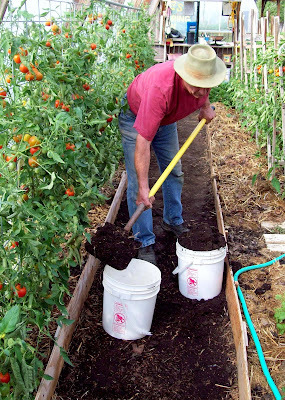 Tomato-plants systematically being cut-up into the paths. The fallen tomatoes and weeds in the bed to the left of Llyn will also be scooped out/dug up and put into the path to feed the worms. Layer, after layer, we build up the organic-matter in the paths. 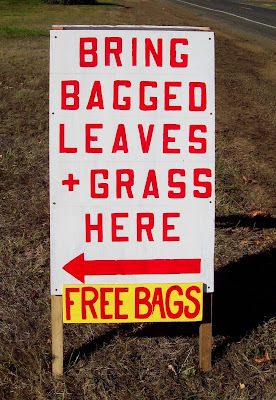 This includes straw (if we have it) and grass-clippings. 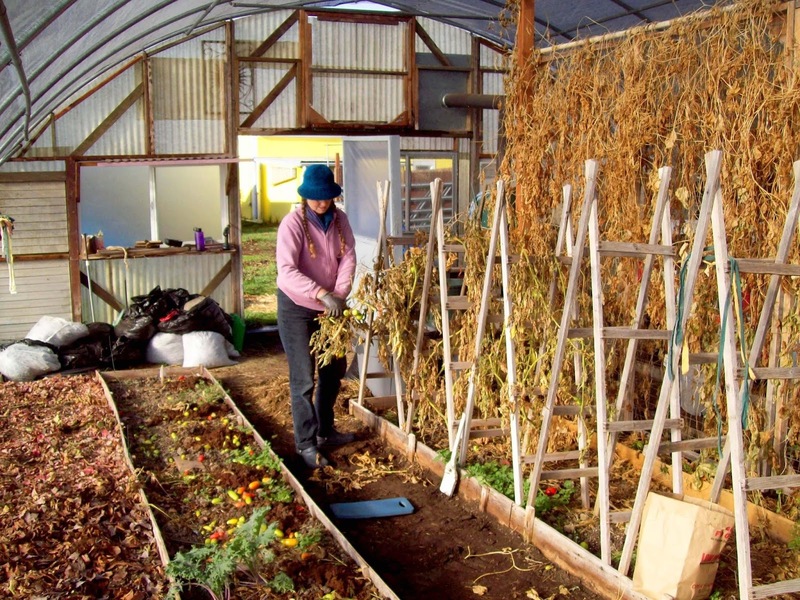 The process is an endless cycle, creating soil-fertility from local and veganic materials. 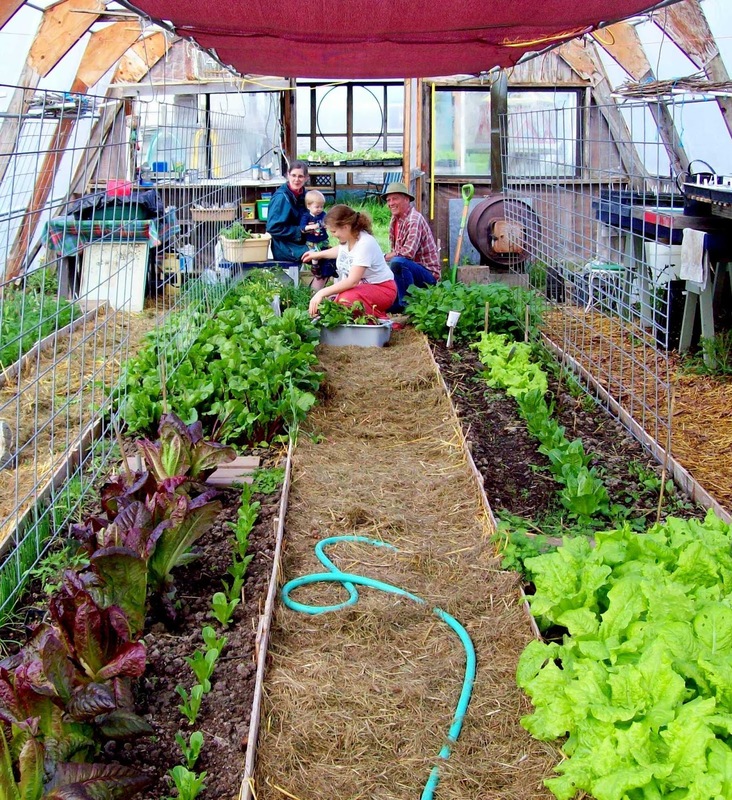 This method of growing, yields nutrient-dense, delicious food! The happiness of each sought by all. Your chance to be a hero! Donate here. In 2011 we were turned down for the grant we applied for. The agency said there had been an enormous surge in granting requests and they just couldn't fill them all. Our needs are minimal at this time as we have the infrastructure in place: fences, hoses, tools have all been donated/purchased. 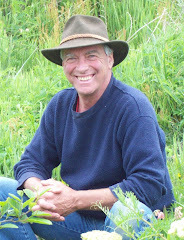 But some costs are on-going and Chris and I volunteer full time to keep the gardens thriving and bring you news through this Blog. Any amount helps. Donate through PayPal by clicking on the button below, or follow this link to find our mailing address if you prefer to send a check. 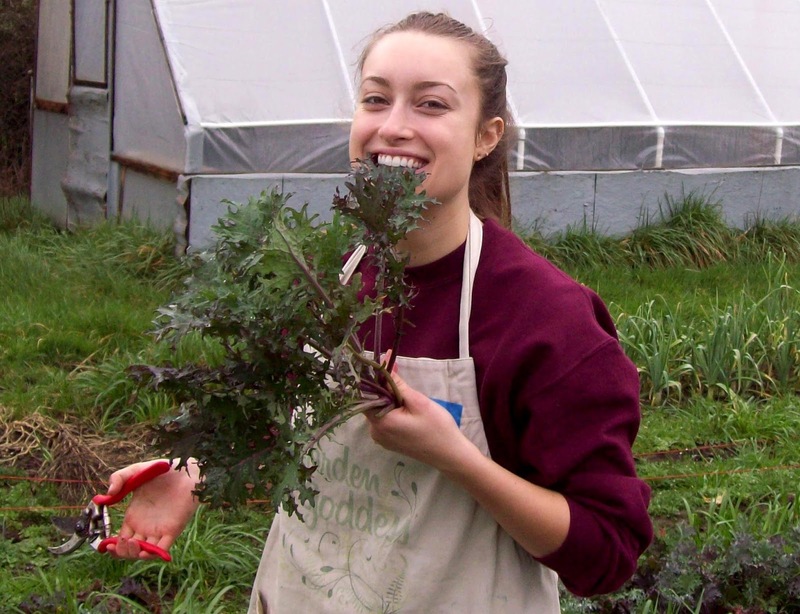 All donations go directly for the support of the gardens and are tax-deductible. Sprouting potatoes? What to do. Subsistence Pattern - Great Resource! 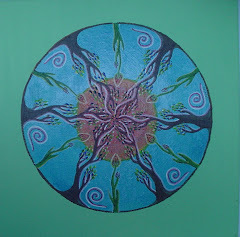 Note the plant sprouting in the center. Now that's a lot of mulch! 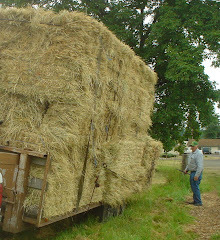 Gene Boshart donated 7 tons of spoiled hay to our project. ...to keep the tomatoes safe. 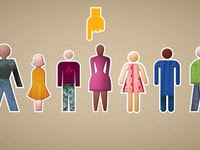 "How To Share the World"
A short video with big ideas about food, hunger, farming and the economy.